I recently discovered I have been lied to by members of my faith community. I know I have been lied to a lot in this life and I will be lied to many more times before I die, but what shocks me most this time is the source of where the lies came from. I do not think they realize just how much this has hurt me. I am now reconsidering a lot of my roles and planning on cutting back my volunteering in order to not be around these individuals. But at the same time, I do not want to let down those who count on me. I know I should turn the other cheek and all that jazz, but I am still conflicted. Advice would be appreciated. Here is my second article for the YCN. It was supposed to be on when you (the author) decided it was the right time to start a family and if you thought it was advice to share with others. My husband and I were engaged for three years before we got married. Why did we wait? We wanted to finish school. We were married for two years before we bought a home. Why did we wait? We wanted to be established in our careers. As we neared thirty, we began to consider starting a family. There were always reasons to wait: someone changed their job, someone’s car broke down, etc. How much time did we want with just us? I was talking at family function with one of my aunts and she informed me that there is never a perfect time to start a family. There will never be enough money. There will never be enough time. You will never be at the right point in your relationship. My husband and I sat down and really considered this. She was right, no doubt about it. We decided to go ahead and do it. We only tried for two months before we found out we were pregnant and it was an amazing feeling. Nine months later, our beautiful little boy was born. Times are hard, things get rough, and I never have enough hands, but I would not trade my little guy for anything. In fact, every time I look into his big, blue eyes, I cannot wait to make him a big brother. I am so glad we decided to listen to her and I freely give that advice to others. If you are seeking the perfect time to have your first, you will never find it and time you could be rearing your child will slip away. If you want a child, while you want them, now, is the perfect time. I know they say potty training boys is more difficult than potty training girls, but I am about at my wits end. He has told us while out, like at a relative’s house, that he has to go to the bathroom, we will take him, and he will go. While at home, if we wait for him to tell us, he will pee in his underwear every time. If he goes in his underwear, he knows he does not get his treat. He will fuss a bit about this, but obviously it is not a big enough deterrent to keep him from wetting himself. I need any advice from the parents out there who have potty trained a boy. There must be something else we can try; a different way of doing things, a different treat, etc. I appreciate any ideas. Thanks. A little shy of 3,000 words today. I am immensely proud of myself. It seems to be getting easier with time, which is good. I have so many notes and random scenes that need to be put into a flowing and coherent story. MJ got to play in the snow for the first time last week. He had a blast! 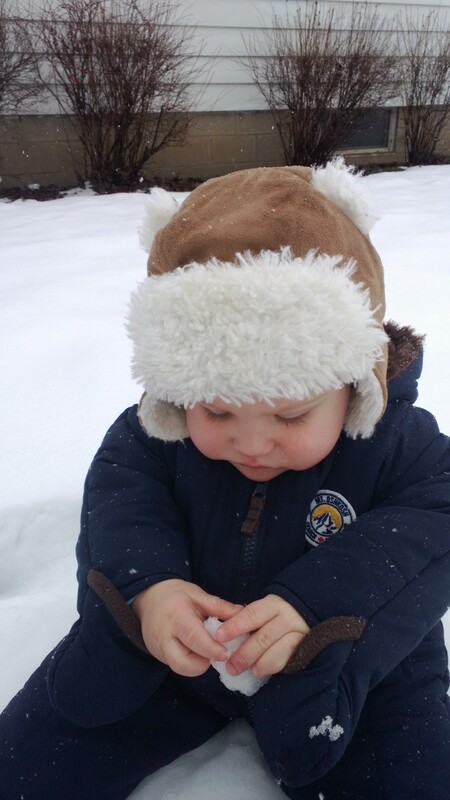 We made a little snowman, which he promptly knocked over because he wanted to eat it. He rolled around, laughed a little, and then took an amazing nap for mommy 😀 I am so glad I get to spend so much time with him; I wish it could be more.